NEW: Somalia, Ethiopia deny invasion; report called propaganda, "fabricated"
(CNN) -- Ethiopian forces returned to Somalia on Tuesday, seizing control of a Somali border town, a local journalist told CNN. 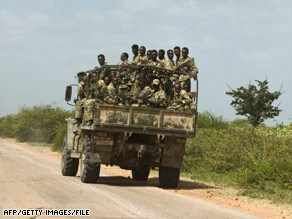 Ethiopian troops roll into Somalia in 2006. The Ethiopians rolled into the town of Kalabeyr early Tuesday in 15 military vehicles, some equipped with heavy artillery, a town elder told the journalist. They established vehicle checkpoints throughout the town and positioned themselves in the surrounding mountains, according to the journalist, who spoke to CNN from a nearby town. Both Somalia and Ethiopia have denied the reports. "This is another fabricated story," Ethiopian Foreign Ministry spokesman Wahade Bela said. "Our troops are still in our territory." A spokesman for Somalia's new president, Sheikh Sharif Ahmed, dismissed the report as propaganda from the Islamist militia, Al-Shabab. Ethiopia invaded Somalia in 2006, with the support of Somalia's weak transitional government, and ousted the Islamic Courts Union, which had taken control of the country months earlier. But Ethiopia's presence was highly unpopular and aggravated extremist groups, who fought a bloody battle to oust the neighboring country's forces. Ethiopia pulled its troops out of Somalia earlier this year, making way for a new Somali transitional government led by one of the former Islamic Courts Union leaders. It is unclear why the Ethiopians went into Kalabeyr, which is in Somalia's Hiiran province. It may be a move to protect their own interests against the Islamist militant group, Al-Shabab, which recently seized control of several towns outside Somalia's capital, Mogadishu. Kalabeyr has never been under Al-Shabab's control, but there are concerns that the militants could advance on the nearby city of Beledweyn, the provincial capital of Hiiran. Al-Shabab recently seized the towns of Jowhar and Mahaday in the Middle Shabelle Region, which adjoins Hiiran. Al-Shabab -- once the armed wing of the Islamic Courts Union -- has been designated as a terrorist group by the United States, which says the group is affiliated with the al Qaeda terrorist network. The United States backed the Ethiopian invasion that drove the ICU from power in 2006. CNN's Ben Brumfield and Journalist Mohamed Amiin Adow contributed to this report.